Vigorous, well-branched small evergreen shrub with upright habit and long, glossy deep green leaves. 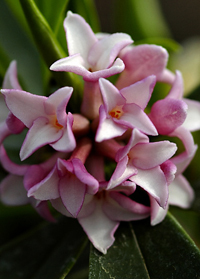 Dark pink buds open in late winter to pink and white blooms with a rich, sweet fragrance. Who says winter has to be boring!